Village of Sawai, Maluku, is one of destinations in the Manusela National Park. The waters are calm and clean. This tourism village has the same beauty with other islands in Indonesia. This village is famous for its beaches and sea. Most of the sea in the this village is still natural and well preserved. Sawai village is including the oldest villages in Maluku and it has several small islands surrounding it. These islands are also adds to the beauty of the Sea of Sawai. What is unique of this village is there is “giant swimming pool”. This pool is a source of water village in Sawai and it is located in the center of the village. The springs from this pool is coming from the stone boulder in the middle of the pond. The sparkling water in the pool is like crystal clear, and we can see the bottom clearly. Not only the sea, along the way from Ora beach to the village of Sawai, we can see the cliffs and Manusela valleys, that located by the Sawai sea is also have million potential caves with tremendous sightseeing. Not far from the location of the reef, there is a big gap and height that can be entered by tourists. Currently the village of Sawai is also having some endemic animals, such as cockatoos spooky, parrot head black, and hornbill. But unfortunately, the current population of parrot-headed black is almost waned. 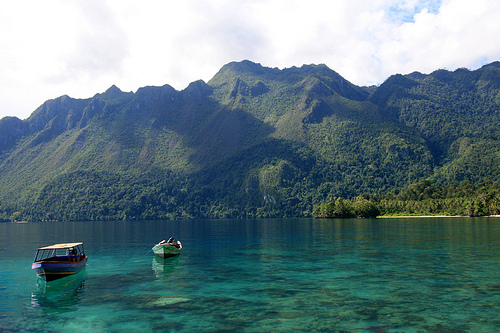 Maluku is having so much potentials beauty in tourism, and most of all are still hidden and un-promoted. This is true that we call Manusela National Park is a Heaven on Earth or the hidden pearl in East Indonesia.